GAEA Green Alternative Energy EAD is a Bulgarian company offering solutions for waste management/environmental protection, waste utilization and alternative fuels production. GAEA Green Alternative Energy is a joint venture between Evolution Environmental Group LLC (“E2”) an American environmental and alternative energy company and Titan Cement SA (“TITAN”), a leading international manufacturer of building materials. TITAN incorporates more than 40 companies involved in the production of a wide range of materials – from inert materials to various types of grey cement, white cement, concrete, dry construction mixes, fly ash, etc. 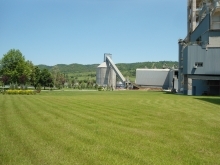 The company owns and operates 13 cement plants in Southeastern Europe, the US and the Eastern Mediterranean. The delivered waste materials are delivered inside the special purpose building and fed into the primary shredder. 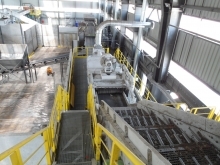 The shredded materials are then transported by belt conveyor to the second stage for further treatment. Separation of the useful light fraction from inert materials (small rocks, glass, metals, dirt, and sand) is achieved though the vibrating screen. After the vibrating screen a wind sifter is used to further separate the light fraction (drier and two dimensional particles) from the heavy fraction (wet, heavier and three dimensional particles). The light fraction is then transported into the secondary shredder. The shredded materials are either stored in piles on the storage floor or sent to the storage silo for feeding to the kiln.